I'ts always fab seeing our work on front covers. 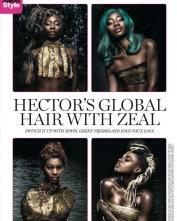 #hectorobeng #hectorsglobalhairwith zeal. "I loved this shoot. It was very challenging working in the river thames for this shoot. The whole team from Matt Marsh , Amanda Thorell, Philomena Obeng, Thedora Adjapong,ako designes and all the models where fab.